As the groups’ research technician, Daniël is responsible for a variety of things in and around the lab such as safety, purchase and maintenance of equipment, purchase of consumables and supervision of undergraduate students. 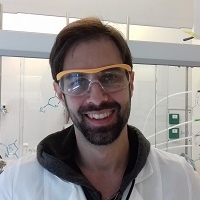 In addition he works on several research projects either to aid PhD students in their final stages or to synthesize tailored molecular probes for collaborative projects with various life science researchers. In chemical biology, the near-infrared (NIR) aza-BOdipy class of fluorescent dyes 1 are anticipated to have high potential for living cell imaging . The synthesis of these fluorophores involves a microwave assisted formal [1+4] cycloaddition between azadienes and an isocynanide. Since the aza-BOdipy’s might be used as molecular probes, a diverse library of different analogues is examined on their photo-luminescent properties as well. In the context of the JECL (Joint European Compound Library), we are also working on the synthesis of globular-shaped saturated heterocycles 2, whose basic scaffold resembles some polycyclic alkaloid-type natural compounds with interesting biological activities . The key step towards these targets is a highly modular one-pot multicomponent process. The products might then be subjected to further modifications, or are eventually screened for biological activity. Reinhardt, C.J., Zhou, E.F., Jorgensen, M.D., Partipilo, G., and Chan, J., J. Am. Chem. Soc., 2018, 140 (3), 1011-1018. Dyke, S. F., Quessy, S. N., In the Alkaloids, Vol, 18. Edited by R. G. A. Rodrigo. Academic Press, Inc., New York, 1981, 1-98.